Farmland constitutes 9730.22 km2 of the geographical municipal area. Wetlands cover 4.8 % of the Letsemeng municipality. The terrain morphology indicates that most of the Letsemeng jurisdiction consists of lowlands with hills. 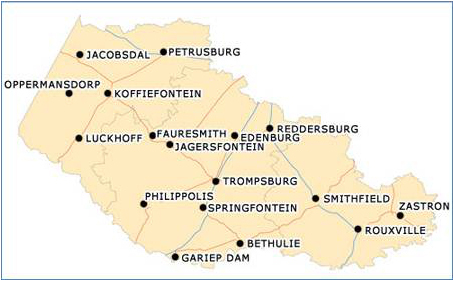 Slightly irregular plains and pans characterize to Jacobsdal, Petrusburg, Koffiefontein and Luckhoff areas. The geology of Letsemeng consists mainly of Kalahari sands formations. Letsemeng falls in the rainfall area of between 350 mm and 500 mm mean annual rainfall. Temperatures are extremely, and the area experiences hot mid-summer conditions and very cold winters.